This page is a translated version of the page Fratelli Cavaliere and the translation is 100% complete. Although not strictly a fountain pens manufacturer, the Fratelli Cavaliere has a significant role in the Italian fountain pen history, as it is at the apex in the overlay processing that are found in pens distributed by many other brands. 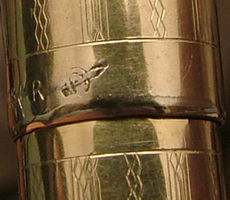 Therefore, even in the absence of a production marked explicitly Fratelli Cavaliere is quite common to find pens bearing the company logo: a horseshoe intersected by a stylus, showed in the side picture, registered with the words "Fabbrica penne oro e fermagli", The company production can also identified, by the less known Linda Darnes punch (wife of founder Giuseppe Cavaliere) shown in the picture below. The company was based in Milan, in Via Cesare da Sesto 12 and was active from the 20s to 50s. It is not known a founding date but Letizia Jacopini indicates the mid-20s, and the full name of "Prima Fabbrica Nazionale Penne Oro e Matite". Its overlays can be found on pens of the most famous brands like Montblanc, Kaweco, Astoria, Waterman, Columbus, and other less known as Omega, Europa, Aurea. The company catalogs reported hundreds of motifs and decorations available. In addition to overlay products for other brands it is believed that the company direct production is linked to various brand names. The main one is probably Universal for there are may sample with the brand punch, other are Ideal and Anglo-Amer; for this latest trademark (more precisely for the "THE ANGLO AMER fountain pen") the company claims to be and agent in the envelope shown by side; we don't know it this is related to the Angloamer trademark. The Fratelli Cavaliere it's best known for the production of the beautiful overlays made on behalf of Waterman, for which the company officially became the producer in the years around 1931/32, wich are among the finest of that period. ↑ the full image is on the Letizia Jacopini book where is reported as "Marca di fabbrica, C.P.E. 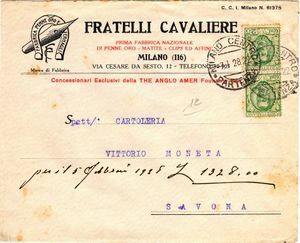 Milano N. 61375", while in this envelop is mentioned "C.C.I. Milano N. 61375", but unfortunately this trademark does not appear in the online archive of the Archivio Centrale dello Stato. ↑ following wat said by Letizia Iacopini here.